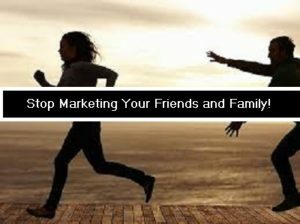 Stop marketing to your friends and family, there is a better way to get eyes in front of your MLM business or products. Have you ever asked yourself why can’t I get people to join my business? Why can’t they see this is a great opportunity? The problem is not you! There is probably a sponsor telling you to keep plugging through the NO’s until someone says YES. You have been told that network marketing is sales business. Well it isn’t it, in reality it is a teaching and mentoring business. You should really focus less on your product and more on the people. Find out how you can help them achieve their dreams and goals. Now, ask me how do I stop a marketing my friend and family. You do this by building a list of individuals that are looking to join a business. This is done by capturing leads and their information so that you can communicate with them on a regular basis. If you would like to here more click the action below. The reality is once you have chased your friends and families and maybe built a team of 100 people only 7 people will put in the work and ride with you. Now if you build a network from individuals looking to run a online business they will continue to build a business. What do I mean, be the individual that truly cares about the people you interact with, build value and they will be attracted to you. People do not join businesses they join people! Give your team true value ensure your process is a duplicatable and it will make your team growth massive. Stop chasing friends and family to your business, implement a system that will generate new leads daily. Be the face of your business, brand “YOU” not the MLM opportunity and focus on helping others achieve their dreams. People are not numbers they have goals and aspirations to be successful in a business and as leaders we want them to reach their goals through duplicating a proven successful system.